The MOTHER 2 Revival Festival is now over in Japan, and MOTHER 2 is no longer available on the Japanese Wii U Virtual Console. Although I’m sure it’ll be back soon enough at its normal price. 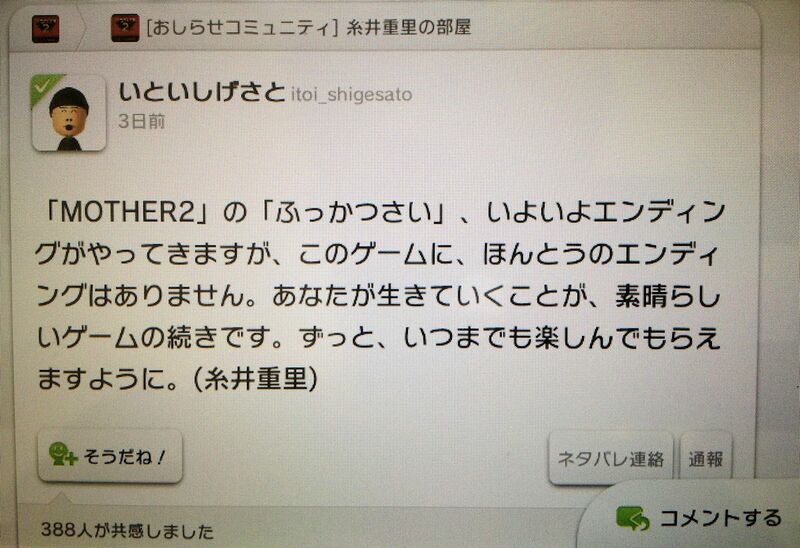 Anyway, because of this, Itoi started posting some messages about the festival coming to a close. All that aside, if you want to see what else he’s posted over the last month on Miiverse, I’ve chronicled and translated them all here! I like the last post best, it truly is touching. I’m confused so the revival festival was just the rerelease of Mother 2. 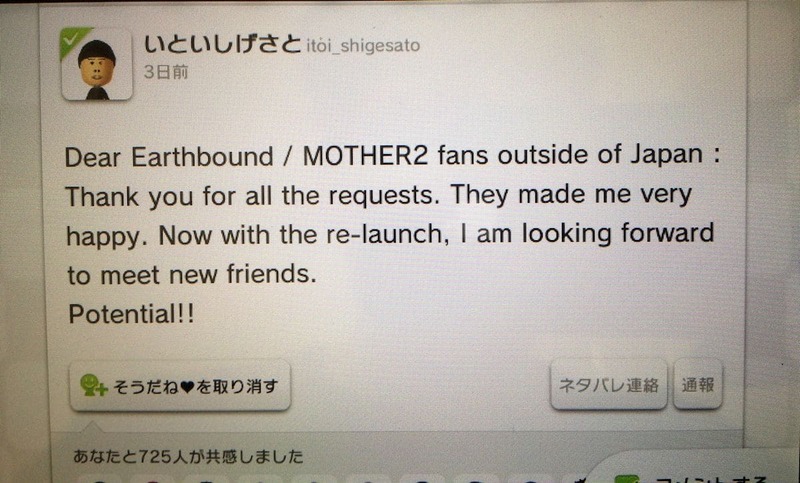 There’s not anything else that was revived by the Mother festival( Excluding EarthBound on Wii U)? 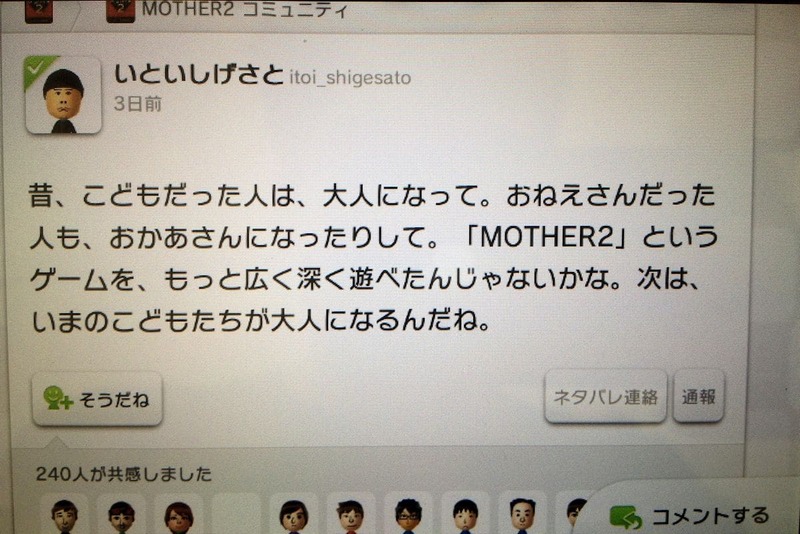 @64RR The revival was for Mother 2, EarthBound wasn’t confirmed till’ the end of it. Those are deep words coming from Itoi himself. If I’m not mistaken, he even said that our lives were the continuation of the Mother series before when the topic of Mother 4 was mentioned to him. Now if only we could use PSI abilities, that would be nice…lol. Anyways, I would love to have a conversation with Itoi on the discussion of Mother, he would make things interesting if I were to discuss it with him. I think we will definitely hear from Itoi again. Before you know it, he’ll be telling us what he had for dinner last night. Itoi was probably scared off Miiverse because it’s intimidating how everyone draws so well. @Misterdigi I feel like compiling a list of all his “I just ate” tweets and blog posts and interview answers and just trying a whole bunch of things that I don’t normally eat. Just to try them. Haha, I totally imagine Tomato getting super angry every time Itoi posts about what food he just ate. Uh… I shed a few tears at his last post. Incredible translations, Mato. I wish I could read the original messages so I knew every little nuance in those last two. They were both very touching to read.